While historians have never determined the first zombie attack, it has been traced all the way back to the medieval era. 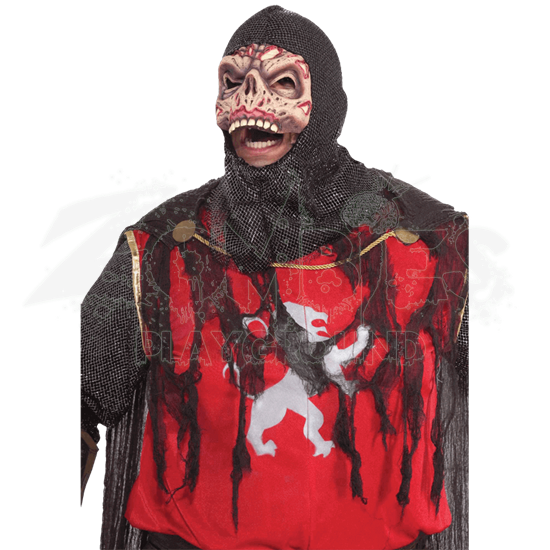 As the Crusader Zombie Costume with Mask shows, a medieval zombie is just as terrifying as a modern one. This impressive costume includes a half-mask for the face that is attached to a faux chainmail mesh that covers the head and neck. The mask covers the upper-half of the face and creates the look of a rotted and decayed zombie that is stuck in an armored coif, its flesh sunken and sallow. The mask ends at the upper jaw, leaving a row of teeth exposed. Also included is a red tunic embellished with a white rampant lion with an attached, tattered gauze cape overlay. Arm guards and shin guards help to make the warrior look more authentic, and a belt is the final touch that makes this costume nearly a complete ensemble. This costume is available in a mens standard size, which fits up to a 42 inch chest. Included with this costume is the half-mask with hood, the tunic with cape, the bracers, the greaves, and the belt. Once you don the Crusader Zombie Costume with Mask, you can begin to show the world how truly fearsome the zombie menace is, and how dangerous a zombie in armor can really be.